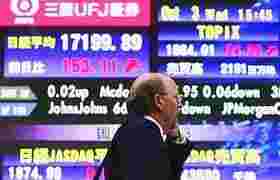 Bangkok: Most Asian markets were lower on Wednesday, although Japanese shares rose for their third straight session and Indian shares registered a record close. Shares fell in Indonesia, Malaysia, New Zealand, Singapore and Thailand. Shares in the Philippines rose to near-record levels as investors there continue to look for a cut in interest rates by the country’s central bank. Stocks in Japan rose to their highest level in more than two months as securities companies soared after Citigroup Inc. said it will take full control of Nikko Cordial Corp. brokerage. The Nikkei-225 rose 0.9% to finish at 17,199.89 points on the Tokyo Stock Exchange—its highest close since 31 July. The index rose for the third straight session, posting a combined 2.5% gain since Monday. Investors and traders are now watching to see if the Nikkei can extend its gains to a technically key range around 17,550. “Bank and real estate stocks could be key drivers" to helping the Nikkei chase those levels, said Masayoshi Okamoto, a general manager at Jujiya Securities Co. Ltd.
Nikko Cordial Corp. rose the 14% daily limit to 1,662 yen after Citigroup said on Tuesday it plans to buy all Nikko shares it doesn’t already own in a stock swap valued at about 530 billion yen, or $4.6 billion (Rs18,308 crore). Extending gains: A passer-by walks past an electronic stock board in downtown Tokyo on Wednesday. The Nikkei-225 rose 0.9% to finish at 17,199.89 on the Tokyo Stock Exchange—its highest close since 31 July. Nomura Holdings Inc., Japan’s largest brokerage, climbed 4%, and Daiwa Securities Group Inc. rose 5.8%. The Topix index, which includes all Tokyo Stock Exchange’s first section issues, added 1.48% to 1,664.01 points. Meanwhile, Hong Kong shares dropped 2.6% on profit-taking after the market’s recent surge. Analysts said the correction has been expected as a result of increasingly expensive valuations, but said they don’t believe the rally is over yet. The blue chip Hang Seng Index fell 2.6% to 27,479.94, after rising to a record of 28,871.04 in the morning session. There was a difference of 1,626 points between the intra-day high and intra-day low. Since 1 September, the benchmark index had shot up 17.6% through Tuesday’s close. Chinese oil producers were among the day’s biggest decliners, due in part to the near $3 decline in crude oil prices from levels around $83 a barrel last week. PetroChina Co. Ltd.’s fell 6.3% on profit-taking after the company’s surge of over 30% over the past month. Sinopec fell 6.1%, and offshore oil producer China National Offshore Oil Corp. (CNOOC) Ltd. dropped 5.6%. Analysts said they don’t expect further major corrections in the benchmark index, thanks to continued fund inflows. “There’s still lots of money pouring into the market," said Y.K. Chan, a fund manager at Phillip Asset Management. Most banking stocks rose early in the session, although profit-taking in the afternoon led all but HSBC and Industrial & Commercial Bank of China to close with losses for the day. Also bucking the trend was Hong Kong & China Gas Co., which rose 9% on expectations that its parent, Henderson Land Development Co. Ltd, will continue to raise its stake in the piped gas provider. Henderson Land said on Wednesday it will buy a 39.1% stake in the company from a separate listed unit. Thailand’s main stock index fell 0.3% to 850.58 in moderate volume. Losses in energy blue-chips capped gains in banking and construction stocks. Indonesia’s composite index on the Jakarta Stock Exchange fell 0.5% to 2,451.59. Malaysia’s Kuala Lumpur composite index dropped 0.1% to 1,366.96 in heavy volume. The benchmark retreated from an intra-day high of 1,380.29 after a mild pullback on other Asian bourses, traders said. Philippine shares surged to a near record high on Wednesday on expectations the central bank will cut key rates. The 30-company Philippine Stock Exchange Index rose 2.5% to 3,769.82—its highest close since 13 July. Indian shares surged on Wednesday, taking cues from strong gains in other Asian markets on Tuesday and closed at record high levels. The Bombay Stock Exchange’s 30-share Sensex index jumped 3.2% to a record close of 17,885 points. Indian financial markets were closed on Tuesday, on a day several Asian markets rose to new highs. South Korean markets were closed on Wednesday for a public holiday. They reopen on Thursday. China’s financial markets are closed 1-5 October for the week-long National Day holiday. They will reopen 8 October. Singapore’s benchmark Straits Times Index (STI) fell as investors took profits after two successive days of record highs. The STI fell 1% to close at 3,754.62. The benchmark S&P/ASX 200 closed flat at 6659.9 on good volume after hitting a fresh record high of 6680.3. Taiwan shares rose on Wednesday to a 10-week high, buoyed by strength in the construction and financial sectors.